Validate and verify your V2X application with our Mx-Drive Mobility Simulator. Use the Mx-DSRC Compliance tester for USDOT certification. Mx-Drive is a multi-vehicle and infrastructure mobility simulator that provides an environment to generate and run real-world conditions to test connected vehicle applications. Testing V2X applications on actual roads has limitations. Only a limited number of test conditions can be achieved, while safety and damage risks further limit test coverage. Mx-Drive combined with the Mx-Suite ecosystem significantly simplifies the testing of Advanced Driver Assistance Systems (ADAS), Sensor Fusion, Radar, and V2X. Mx-Suite is ISO 26262 qualified to test safety applications for OEMs and suppliers. The Mx-Drive extension to Mx-Suite delivers the functionality required for testing in a fully modeled test harness (MIL) and in a bench test fixture (HIL). Routes can easily be specified, both manually and programmatically. Infrastructure transmissions (e.g. MAPs and SPATs) can be configured. Test equipment is precisely time-synchronized using generated GPS transmissions. The existing benefits of Mx-Suite, such as test data presentations, pass/fail determination, reporting, etc., are available. The Mx-DSRC Test System simulates systems in the vehicle that interact with the DSRC radio module to create tests closely replicating real-world scenarios. Its integrated approach allows the DSRC components, such as RF quality and protocol conformance, to be exercised with multiple system components. Mx-DSRC provides a powerful and easy-to-use framework for testing your DSRC system. 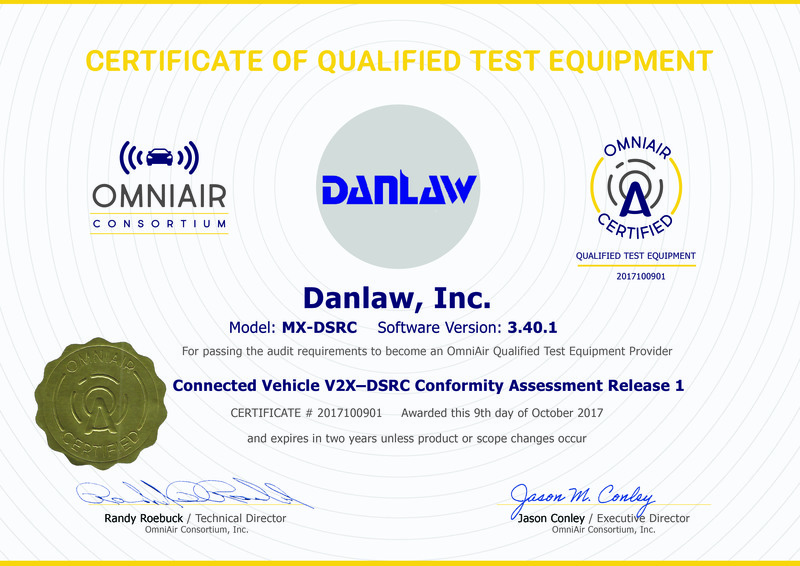 Danlaw provides a complete testing service focused on success that ensures you achieve rapid certification with the proper reporting and audit trail. Mx-Suite is simply the most comprehensive platform for automated embedded software verification and validation.